Das Doku-Archive öffnet wieder seine Schublade 2. Helmut Josef Michael Kohl (German: [ˈhɛlmuːt ˈkoːl]; born 3 April 1930) is a Germanconservative politician and statesman. He served as Chancellor of Germany from 1982 to 1998 (of West Germany 1982–90 and of the reunited Germany 1990–98) and as the chairman of the Christian Democratic Union (CDU) from 1973 to 1998. His 16-year tenure was the longest of any German chancellor since Otto von Bismarck, and oversaw the end of the Cold War. 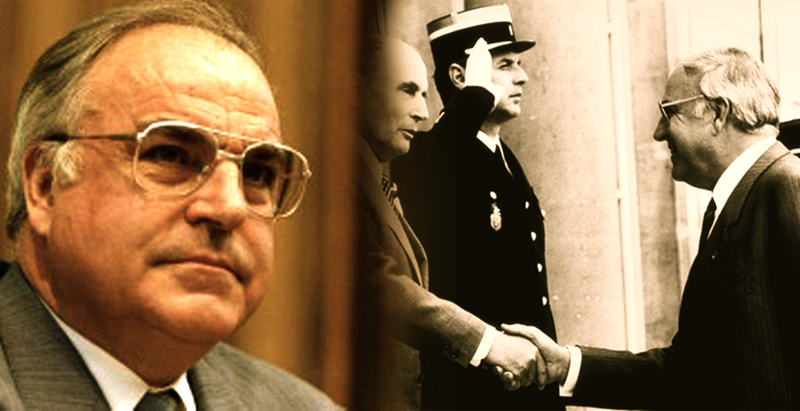 Kohl is widely regarded as the main architect of the German reunification, and together with French president François Mitterrand, he is also considered the architect of the Maastricht Treaty, which established the European Union. Kohl and Mitterrand were the joint recipients of the Charlemagne Prize in 1988. In 1996, he won the prestigious Prince of Asturias Award in International Cooperation. In 1998, Kohl was named Honorary Citizen of Europe by the European heads of state or government for his extraordinary work for European integration and cooperation, an honour previously only bestowed on Jean Monnet. Kohl was described as “the greatest European leader of the second half of the 20th century” by U.S. Presidents George H. W. Bush and Bill Clinton. Kohl was born in Ludwigshafen am Rhein (at the time part of Bavaria, now in Rhineland-Palatinate) Germany, the third child of Hans Kohl (1887–1975), a civil servant, and his wife, Cäcilie (née Schnur; 1890–1979). His family was conservative and Roman Catholic, and remained loyal to the Catholic Centre Party before and after 1933. His older brother died in the Second World War as a teenage soldier. In the last weeks of the war, Kohl was also drafted, but he was not involved in any combat. Kohl attended the Ruprecht elementary school, and continued at the Max-Planck-Gymnasium. In 1946, he joined the recently founded CDU. In 1947, he was one of the co-founders of the Junge Union-branch in Ludwigshafen. After graduating in 1950, he began to study law in Frankfurt am Main. In 1951, he switched to the University of Heidelberg where he majored in History and Political Science. In 1953, he joined the board of the Rhineland-Palatinate branch of the CDU. In 1954, he became vice-chair of the Junge Union in Rhineland-Palatinate. In 1955, he returned to the board of the Rhineland-Palatinate branch of the CDU. After graduating in 1956 he became fellow at the Alfred Weber Institute of the University of Heidelberg where he was an active member of the student society AIESEC. In 1958, he received his doctorate degree for his thesis “The Political Developments in the Palatinate and the Reconstruction of Political Parties after 1945”. After that, he entered business, first as an assistant to the director of a foundry in Ludwigshafen and, in 1959, as a manager for the Industrial Union for Chemistry in Ludwigshafen. In this year, he also became chair of the Ludwigshafen branch of the CDU. In the following year, he married Hannelore Renner, whom he had known since 1948, and they had two sons. In 1960, he was elected into the municipal council of Ludwigshafen where he served as leader of the CDU party until 1969. In 1963, he was also elected into the Landtag and served as leader of the CDU party in that legislature. From 1966 until 1973, he served as the chair of the CDU’s state branch, and he was also a member of the Federal CDU board. After his election as party-chair, he was named as the successor to Peter Altmeier, who was minister-president of Rhineland-Palatinate at the time. However, after the Landtag-election which followed, Altmeier remained minister-president. On 19 May 1969, Kohl was elected minister-president of Rhineland-Palatinate, as the successor to Peter Altmeier. During his term as minister-president, Kohl founded the University of Trier-Kaiserslautern and enacted territorial reform. 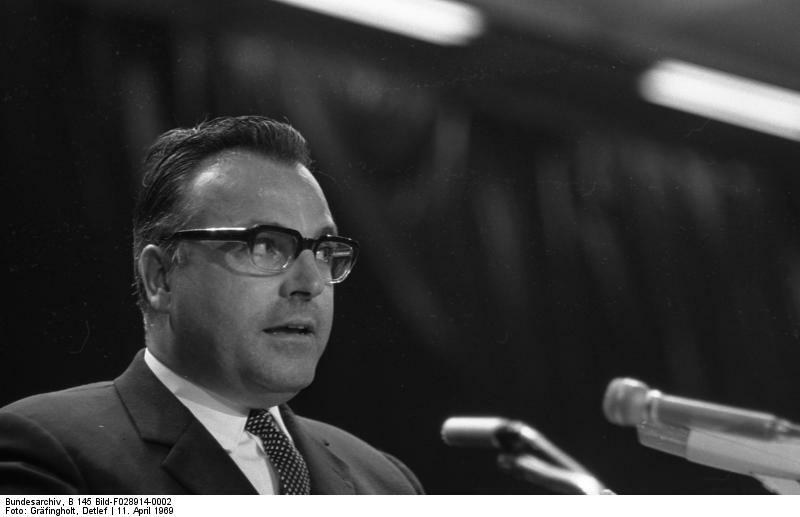 Also in 1969, Kohl became the vice-chair of the federal CDU party. In 1971, he was a candidate to become chairman of the federal CDU, but was not elected. Rainer Barzel remained in the position instead. In 1972, Barzel attempted to force a cabinet crisis in the SPD/FDP government, which failed, leading him to step down. 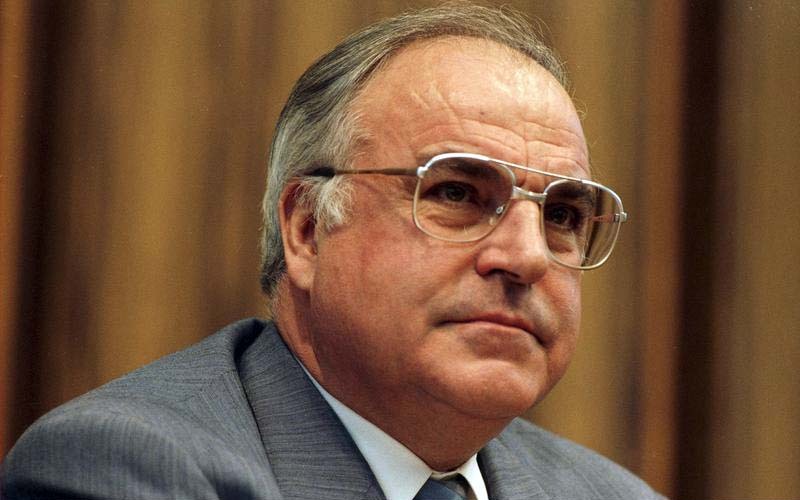 In 1973, Kohl succeeded him as federal chairman; he retained this position until 1998. In the 1976 federal election, Kohl was the CDU/CSU’s candidate for chancellor. The CDU/CSU coalition performed very well, winning 48.6% of the vote. However they were kept out of government by the centre-left cabinet formed by the Social Democratic Party of Germany and Free Democratic Party (Germany), led by Social Democrat Helmut Schmidt. 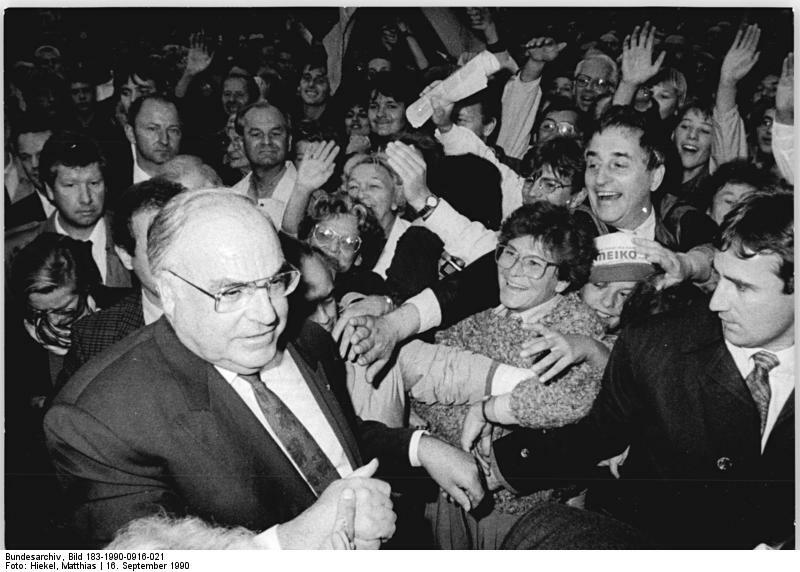 Kohl then retired as minister-president of Rhineland-Palatinate to become the leader of the CDU/CSU in the Bundestag. He was succeeded by Bernhard Vogel. In the 1980 federal elections, Kohl had to play second fiddle, when CSU-leader Franz Josef Strauß became the CDU/CSU’s candidate for chancellor. Strauß was also unable to defeat the SPD/FDP alliance. 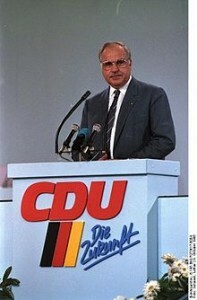 Unlike Kohl, Strauß did not want to continue as the leader of the CDU/CSU and remained Minister-President of Bavaria. Kohl remained as leader of the opposition, under the third Schmidt cabinet (1980–82). On 17 September 1982, a conflict of economic policy occurred between the governing SPD/FDP coalition partners. The FDP wanted to radically liberalise the labour market, while the SPD preferred to guarantee the employment of those who already had jobs. The FDP began talks with the CDU/CSU to form a new government. On 1 October 1982, the CDU proposed a constructive vote of no confidence which was supported by the FDP. The motion carried. Three days later, the Bundestag voted in a new CDU/CSU-FDP coalition cabinet, with Kohl as the chancellor. Many of the important details of the new coalition had been hammered out on 20 September, though minor details were reportedly still being hammered out as the vote took place. Though Kohl’s election was done according to the Basic Law, some voices criticized the move as the FDP had fought its 1980 campaign on the side of the SPD and even placed Chancellor Schmidt on some of their campaign posters. Some voices went as far as denying that the new government had the support of a majority of the people. In answer, the new government aimed at new elections at the earliest possible date. As the Basic Law is restrictive on the dissolution of parliament, Kohl had to take another controversial move: he called for a confidence vote only a month after being sworn in, in which members of his coalition abstained. The ostensibly negative result for Kohl then allowed President Karl Carstens to dissolve the Bundestag in January 1983. The move was controversial as the coalition parties denied their votes to the same man they had elected Chancellor a month before and whom they wanted to re-elect after the parliamentary election. However, this step was condoned by the German Federal Constitutional Court as a legal instrument and was again applied (by SPD Chancellor Gerhard Schröder and his Green allies) in 2005. In the federal elections of March 1983, Kohl won a resounding victory. The CDU/CSU won 48.8%, while the FDP won 7.0%. Some opposition members of the Bundestag asked the Federal constitutional court to declare the whole proceedings unconstitutional. It denied their claim. The second Kohl cabinet pushed through several controversial plans, including the stationing of NATO midrange missiles, against major opposition from the peace movement. On 24 January 1984, Kohl spoke before the Israeli Knesset, as the first Chancellor of the post-war generation. In his speech, he used liberal journalist Günter Gaus’ famous sentence that he had “the mercy of a late birth” (“Gnade der späten Geburt”). In 1985, Kohl and US President Ronald Reagan, as part of a plan to observe the 40th anniversary of V-E Day, saw an opportunity to demonstrate the strength of the friendship that existed between Germany and its former foe. During a November 1984 visit to the White House, Kohl appealed to Reagan to join him in symbolizing the reconciliation of their two countries at a German military cemetery. As Reagan visited Germany as part of the G6 conference in Bonn, the pair visited Bergen-Belsen concentration camp on 5 May, and more controversially, the German military cemetery at Bitburg, discovered to hold 49 members of the Waffen-SS. In 1986, more controversy was caused by an essay published in the Frankfurter Allgemeine Zeitung on 25 April 1986 entitled Land Without A History, written by one of Kohl’s advisors, historian Michael Stürmer, in which Stürmer argued that West Germany lacked a history to be proud of, and called for effort on the part of the government, historians and the media to build national pride in German history. Though Stürmer insisted that he was writing on behalf of himself and not in an official capacity as the Chancellor’s advisor, many left-wing intellectuals claimed that Stürmer’s essay also expressed Kohl’s views. After the federal elections of 1987 Kohl won a slightly reduced majority and formed his third cabinet. The SPD’s candidate for chancellor was the Minister-President of North Rhine-Westphalia, Johannes Rau. In 1987, Kohl received East German leader Erich Honecker – the first ever visit by an East German head of state to West Germany. This is generally seen as a sign that Kohl pursuedOstpolitik, a policy of détente between East and West that had been begun by the SPD-led governments (and strongly opposed by Kohl’s own CDU) during the 1970’s. 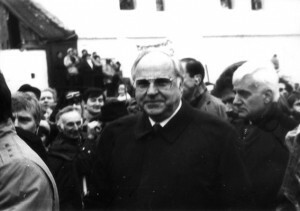 Helmut Kohl in Krzyżowa (Kreisau), Poland, 1989. Following the breach of the Berlin Wall and the collapse of the East German Communist regime in 1989, Kohl’s handling of the East German issue would become the turning point of his chancellorship. Kohl, like most West Germans, was initially caught unawares when theSocialist Unity Party was toppled in late 1989. However, well aware of his constitutional mandate to seek German unity, he immediately moved to make it a reality. Taking advantage of the historic political changes occurring in East Germany, Kohl presented a ten-point plan for “Overcoming of the division of Germany and Europe” without consulting his coalition partner, the FDP, or the Western Allies. In February 1990, he visited the Soviet Union seeking a guarantee from Mikhail Gorbachev that the USSR would allow German reunification to proceed. One month later, the Party of Democratic Socialism — the renamed SED — was roundly defeated by a grand coalition headed by the East German counterpart of Kohl’s CDU, which ran on a platform of speedy reunification. By the spring of 1990, the East German economy had sunk into near-paralysis. Accordingly, on 18 May 1990, Kohl signed an economic and social union treaty with East Germany. This treaty stipulated that when reunification took place, it would be under the quicker provisions of Article 23 of the Basic Law. That article stated that any new states could adhere to the Basic Law by a simple majority vote. The alternative would have been the more protracted route of drafting a completely new constitution for the newly reunified country, as provided by Article 146 of the Basic Law. Over the objections of Bundesbank president Karl Otto Pöhl, he allowed a 1:1 exchange rate for wages, interest and rent between the West and East Marks. In the end, this policy would seriously hurt companies in the new federal states. Together with Foreign Minister Hans-Dietrich Genscher, Kohl was able to resolve talks with the former Allies of World War II to allow German reunification. He received assurances from Gorbachev that a reunified Germany would be able to choose which international alliance it wanted to join, although Kohl made no secret that he wanted the reunified Germany to remain part of NATO and the EC. A reunification treaty was signed on 31 August 1990, and was overwhelmingly approved by both parliaments on 20 September 1990. On 3 October 1990, East Germany officially ceased to exist, and its territory joined the Federal Republic as the five states of Brandenburg, Mecklenburg-Vorpommern, Saxony, Saxony-Anhalt and Thuringia. These states had been the original five states of East Germany before being abolished in 1952, and had been reconstituted in August. East and West Berlin were reunited as the capital of the enlarged Federal Republic. After the fall of the Berlin Wall, Kohl confirmed that historically German territories east of the Oder-Neisse line were definitively part of Poland, thereby relinquishing any claim Germany had to them. In 1993, Kohl confirmed, via treaty with the Czech Republic, that Germany would no longer bring forward territorial claims as to the pre-1945 ethnic German so-called Sudetenland. This treaty was a disappointment for the German Heimatvertriebene (“displaced persons”). After the federal elections of 1994 Kohl narrowly defeated Minister-President of Rhineland-Palatinate Rudolf Scharping. The SPD was however able to win a majority in the Bundesrat, which significantly limited Kohl’s power. In foreign politics, Kohl was more successful, for instance getting Frankfurt am Main as the seat for the European Central Bank. In 1997, Kohl received the Vision for Europe Award for his efforts in the unification of Europe. By the late 1990s, the aura surrounding Kohl had largely worn off amid rising unemployment. He was heavily defeated in the 1998 federal elections by the Minister-President of Lower Saxony, Gerhard Schröder.